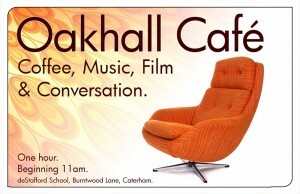 What happens at an "Oakhall Café"? We hope that all who come feel - as well as it being an entertaining hour - that it fuels further thought and conversation about some of those important big themes that we sometimes leave untouched in everyday conversation. Our next Oakhall Café is on: 22 October at 11am FEATURING: Martha Collison – Great British Bake Off quarter-finalist – Waitrose columnist – Author of books: Twist & Crave Welcome!